Many students (and their parents) want to know what you can do with a major or minor in Classics. The answer is that you can do anything. 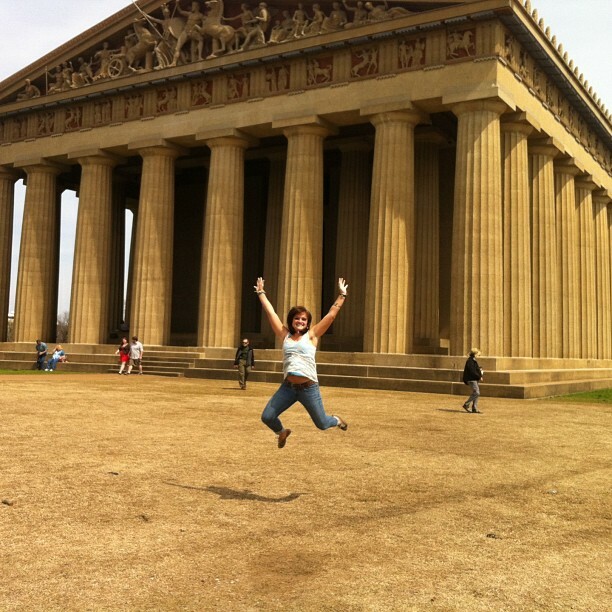 Gabby Coggin (Classics 2013) at the Nashville Parthenon. In addition to giving you a chance to learn a language, explore a culture and address questions of enormous humanistic and historical significance, studying Classics hones your abilities to read, write, see and think analytically. Facility in these areas will help carry you into satisfying careers and into the world at large as an effective citizen. Your path may not be as linear as some, but it also won’t be singular—a well-trained mind can adapt to turns in the road, new directions, and roads that haven’t even been built yet! A recent article in PreLaw, a journal for prospective law student confirmed once again that Classics majors top the list in LSAT scores. studied Classics at University of Michigan, Columbia University, UGA, FSU and elsewhere. begun teaching Latin, humanities, math, science in middle schools and high schools. gone to law school and become practicing lawyers. entered medical, nursing, or dentistry schools. studied math at Cambridge as a Gates Cambridge Scholar. earned graduate degrees in anthropology, counseling, museum studies, library science, political science, history, creative writing . . . The Department of Classics boasts a vibrant community of more than forty majors, a rich slate of courses in Greek, Latin and Classical Civilization each term and lots of events throughout the year to keep you involved in Classics beyond the classroom. Feel free to get in touch with Dr. Pasco-Pranger or any of the Classics faculty to discuss a Classics major or minor or check the catalog.